Happy Halloween, everybody! 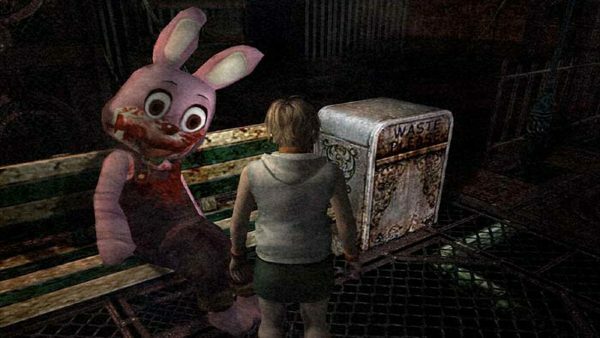 To celebrate the spookiest day of the year, we decided to bring you our very first team article as we delve into the past to unearth our scariest gaming moments. Turn off the lights, get comfortable and prepare to join us on a trip down terror lane! Mwhaha! I must have been around the ages of 9 or 10 when my mother decided to visit a friend for a good ol’ catch up and a cup of tea. Dreading the idea of having to listen to the tittle tattle of women’s talk, I wandered off in search of entertainment. Mercifully, I stumbled across an ugly grey saviour in the form of a Sony PlayStation, nestled under the TV in the living room. I immediately knew that playing this game was wrong. I knew that every step I took around this derelict, distinctly empty mansion was making my heart palpitate like never before. But I also knew that this sense of anxiety and feeling of complete unease was exactly the reason I couldn’t stop playing; I was compelled to continue through sheer fear alone. After walking past a dining table and discovering some unknown blood on the floor, I entered a room to hear the unpleasant, foreign sound of what could only be described as muffled munching. As I progressed towards the end of the corridor the disturbing noise grew louder. When you’re the tender age of seven what could be scarier than the thought of some weird purple claw-like hand coming down from the heavens, snatching away your blonde bombshell of a girlfriend, only then to be greeted by some bird-like shaman who casts a spell on you; leaving you retro morphed down the evolutionary ladder as you’re transformed into a bulbous, ungodly, ape-like creature. Unfortunately, for poor old Toki (a tarzan-esque, loincloth wearing tribesman), this was his true hell on Earth. In Japan, the game was known as JuJu Densetsu. if that title didn’t scare you (and when has the words JuJu ever sounded good) then just have a look at the original arcade cabinet box art. 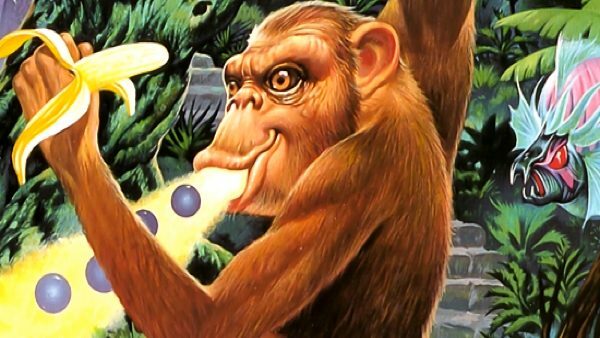 Not only did Toki permanently sear an image of maniacal monkey creatures into my brain, but the music was also very harrowing at the time. The first 5 seconds of the intro music painted a very misleading picture of blissful harmony for me, only then suddenly transforming into such a threatening tone that I wanted to turn off the Mega Drive and run screaming out of the room, swearing never to play Toki again. Oh, and don’t let the title music fool you, either, this is NO furry lovable ape romp. I was so scared to play this game, I even had to get my Dad to play the latter levels just so we could get our monies worth. There’s nothing endearing about this image. Toki: Going Ape Spit is one of those games that will forever leave me with nightmares about being morphed into an ape, having my girlfriend snatched away from me by a claw-hand from the sky and having to monkey spit my way through hordes of crazy-faced baboons to save my abducted sweetheart from a fortress of pure evil. I was about eight or nine years old when my computer-savvy uncle brought around a few stack 5.25” diskettes (anyone remember the original floppy disks?) with various games on them. Point and click adventures were all the rage in the early nineties and Sierra On-Line was king. Having worked my way through several of the King’s Quest series of games, I decided to load up Manhunter: New York: an awry glimpse into the world’s future. Giant floating eyeballs called “orbs” had invaded Earth in the year 2002 (the game was released in 1988) and forced the human race into being implanted with geo-tracking devices, wearing brown robes and not letting anyone talk to each other. You are a Manhunter, recruited by the mysterious orbs to hunt down humans attempting to form a resistance. The game sucked, but it still leaves a lasting memory to this day. Part of your detective skill in the game is to investigate gruesome murders and the player got to experience close ups of the victim’s faces. The one that sticks out was the sickly green skeletal face, complete with eyeballs rolling back in the head and flies circling around. 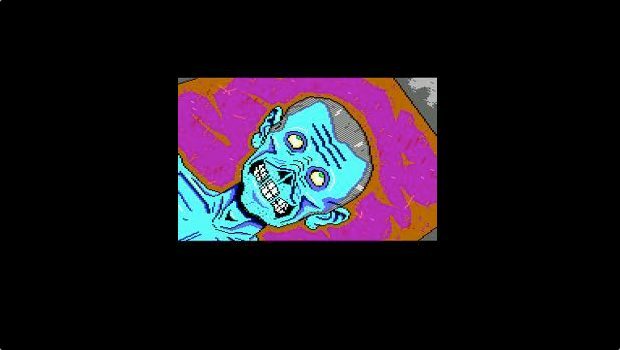 With the color schemes and graphic quality at the time there wasn’t anything too real about it, but for some reason this image of a decomposing face stuck with me and kept me up at night more than a few times. Was it the weird shaped ears? Was it the semi-smiling display of teeth? 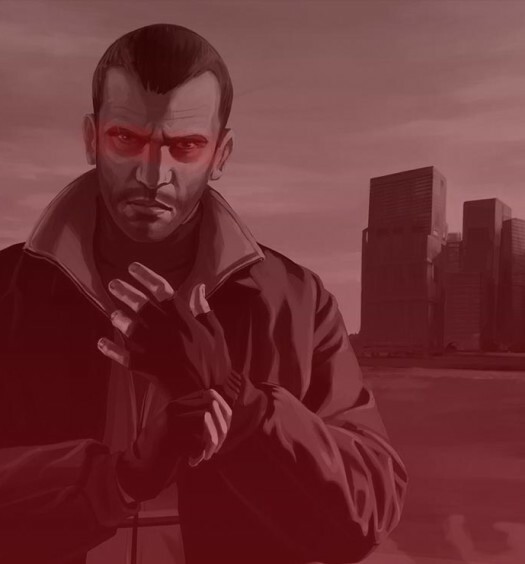 Either way, Manhunter: New York is a game that NO ONE should play. I’ve been shaken up by many a horror title. Mainly ones from the nineties and early 2000’s, and as such, it’s a real shame to see the horror genre’s slow slide towards a more action-oriented focus. While many obviously welcome this more accessible shift, the genre has seen fewer and fewer truly memorable moments in the scare department as the years have rolled by. One such moment left me physically shaking, unable to continue in the game for a good while. The moment? That one room from Silent Hill 3. Silent Hill veterans will know exactly what I’m talking about. On the third floor of Brookhaven Hospital, there’s an unassuming door along one of the hallways. Upon entry, the player finds an empty room with naught but a sink and a large mirror on the wall opposite you. Well, there’s nothing here, you think and immediately turn around and head for the exit. But hang on, the door’s locked. You hear a gurgling noise as a dark red substance begins to seep out of the sink and onto the surrounding walls and the floor. Heather’s reflection starts to decay before it stops dead in its tracks, frozen in suspended animation. The bloody substance eventually covers the whole room and begins to pulsate, as does the pounding music in the background. This isn’t the room in question but it’s equally as disturbing. What isn’t so obvious is the fact that the room starts to drain your health. With no immediate way out, you run for the door again. It’s still locked. All you can think of is getting out of this utterly satanic creation, but the game won’t allow it. At least not for another 30 seconds or so when the door unlocks and you spill out into the hallway. From here on, the rest of the game is as appealing as Blackpool Pleasure Beach compared to the horrors you’ve just faced. That unsuspecting room was unforgettable stuff. DOOM 3 scared the hell out of me when I was a teenager, I’m not going to lie. That ‘Pinky’ demon was the stuff of nightmares. Equally terrifying were the Fast Zombies of Half-Life 2’s Ravenholm stage, a level that I was nearly not permitted to play (not because my parents didn’t approve of turning gas switches to burn humans ingested by headcrabs, but because I spent half of this time listening to my heart pound). 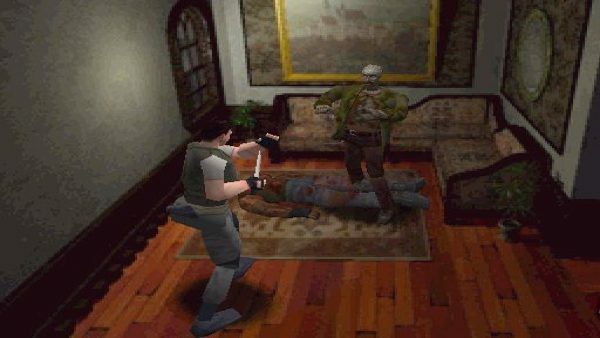 And going way back, those damn dogs in the original Resident Evil have to rank on anyone’s list. 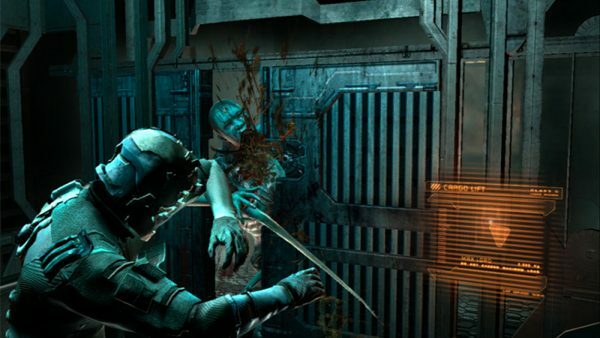 But if there’s one short, adrenaline-racing moment to pick out, I’d have to go with your first encounter with a Necromorph aboard the USG Ishimura in Dead Space. Marooned on a mining ship you’ve been sent to repair, you’re sent to activate a switch in a reception area when an unsettling safety cycle starts humming. In the dark, you can hear thumping in the vents above, your squad mates desperate to identify what in God’s name is going on. A demonic silhouette drops to the ground, and fatally wounds one of your allies… you’re told to run! In a chase sequence, you’re running from one of these demons you can just barely make out behind you. With no weapon, and no option of standing your ground, this is one of the most exhilarating experiences I have ever encountered in a game that recounts the nostalgic thrill of running from a near pursuer in a game of tag – except you don’t want to be IT here. 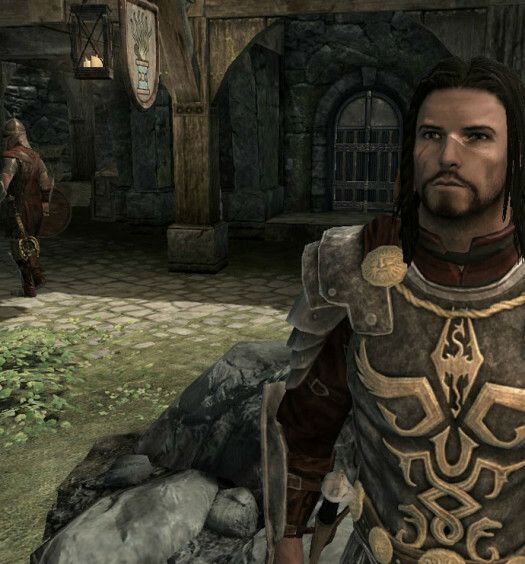 As you reach an elevator, shaking the controller as if to quicken its door’s release, you turn back and close the door. The Necromorph powers its way through the metal, however, and rips open the door, you standing there inconceivably helpless. By sheer miracle, as this creature from hell prepares to pounce, it gets sliced by the door as it returns to its locked position. A sequence of shrieking strings reminiscent of Bernard Hermann play as the elevator descends. You know you’re in for a haunt.